It is my favourite WTF?! 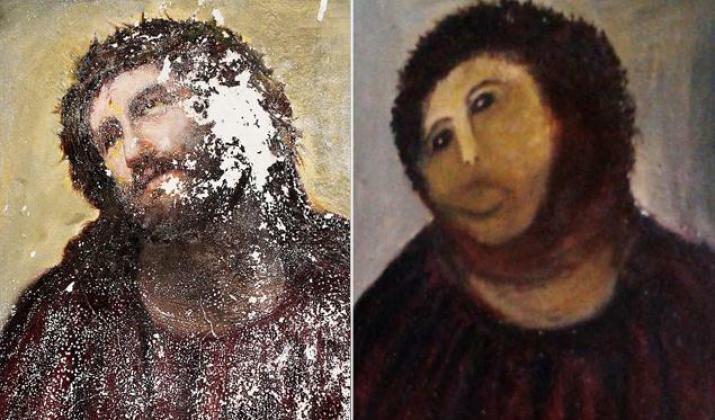 story this week: an amateur art restorer, Cecilia Gimenez, took her hand to Elías García Martínez’s Ecce Homo, a 19th-century painting in a Spanish church in Borja. Watching the interview with the new star of contemporary art about her completely artless disfiguration of the fresco is like watching a scene from an Almodovar film. “We saw that everything was falling down so we fixed it,” Cecilia says, throwing her head back, and absolutely confident in herself in a way that only an Almodovar heroine could be. Then it seems to occur to her that she should invoke the priest. “How could we do something like that without permission? He knew.” It’s Women on the Verge of a Fresco Breakdown. It’s so funny, so perfectly executed, that it could easily be an lost Almodovar masterpiece. Watching the video, which is on the Guardian website, is almost surreal. And now a Facebook page has been created in her honour. As of this morning it had over 52,000 likes. The artwork created for the fan page, beautifully titled ‘Club de Fans de Cecilia : La restauradora del Cristo de Borja’, is inspired. It shows contemporary art and the work that inspired it. There’s Manet’s take on Sanzio, Picasso’s take on Velasquez, Hockney’s take on Van Gogh, Botero’s take on da Vinci. And there’s Gimenez on Martínez. It has been so funny to watch the story go viral, and to watch the art parodies that have followed in its wake. It’s this sort of inventiveness that makes the social network phenomenon such a joy. There is much in the way of Cecilia Gimenez inspired artwork on the social networks today, but this has to be the best response to this bonkers WTF?! story. Click here to watch the video on the Guardian’s website.